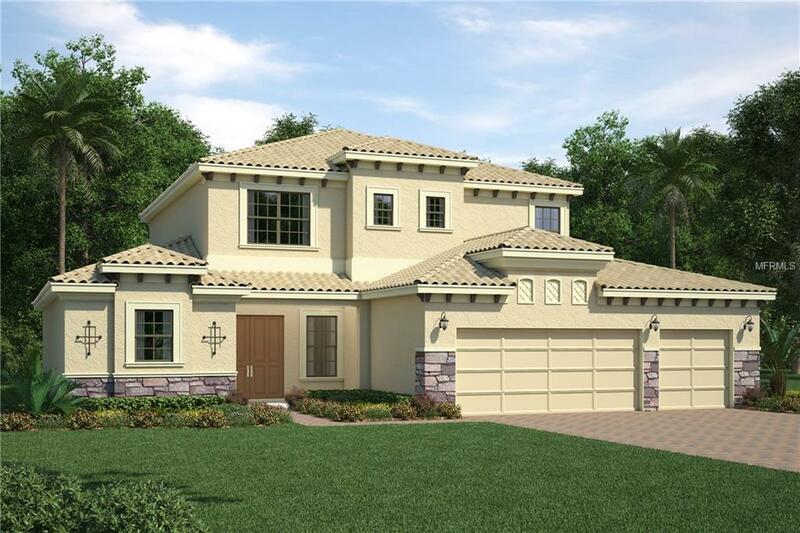 Welcome to Vilano, Sarasota exclusive, centrally located community of 1 acre homesites. The first thing youll notice is space. Space between and behind your homes. As you enter this home you are greeted soaring ceilings and a wonderful staircase with iron spindles along with a wonderful lake and preserve view. Your kitchen is the chefs delight with pantry, breakfast bar and center island with beautiful backsplash and gorgeous granite counters. Youre master suite is on the first floor with an oversized get away with large en-suite boasting walk in shower and soaker tub along with dual sinks and linen closet. 2 Master closets and plenty of room for both a king bed and views of the lake and preserve. 3 additional guest rooms two with private en-suite and walk-in closet along and a generous sized double door den and Game Room. Huge 3 car garage and wonderful lanai highlight your outside spaces along with a cozy front porch all with tile roof and paver driveway. Photos are of the model only; not of the actual home. Home Completion October 2018; Pictures, photographs, colors, features, and sizes are for illustration purposes only and will vary from the homes as built. Home and community information including pricing, taxes, included features, terms, availability and amenities are subject to change and prior sale at any time without notice or obligation.